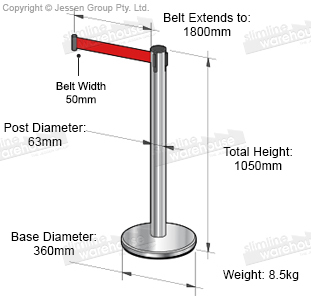 The retractable barrier Australia has a 4-way adapter top the post to connect to other bollards or wall mounted clips in different directions, making the creation of a queue or cordoning off an area easy. 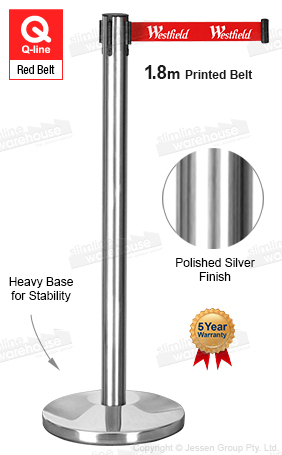 The crowd control posts are made from stainless steel with a silver finish, offering a professional look that will last for years to come in any location. Assembly requires no tools, as the post and base screw together quickly and easily. This belt barricade system, retractable barrier Australia is a unique marketing display that has your custom logo printed in one colour to advertise to visitors as they wait in queue or pass by a sectioned off area. These posts have a 1.8m long red retractable belt made of hard-wearing woven nylon that is easy to reach to posts and clips. Base of system is weighted for stability and has been rubberised to protect floors from getting scratched.